It's Thursday and that means one thing... It's Theater Thursday! Since Halloween is this month I'm going to feature a scary movie!This week's featured movie is...Scream. It's hard to believe that Scream hit the big screen almost 20 years ago. I hate being scared and this movie made me not want to go into the garage for months. 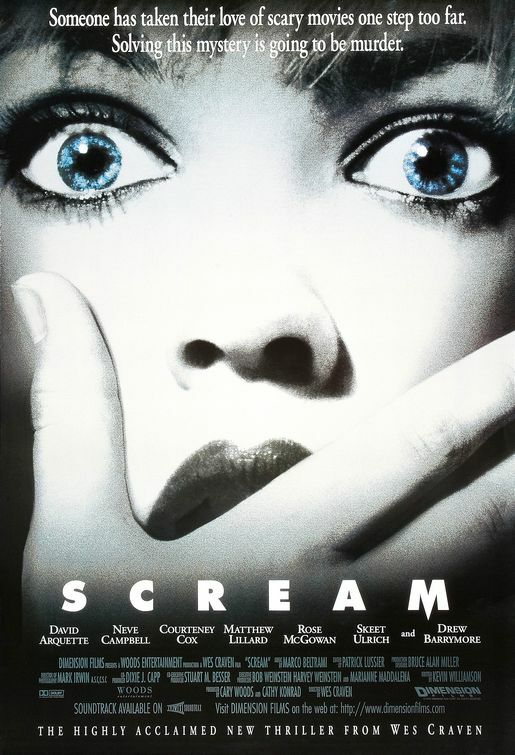 Scream stars Neve Campbell as Sydney Prescott, a teenager living in the small California town of Woodsboro. The one year anniversary of her mother's brutal death is approaching at the weekend and with her father leaving town for a business trip she'll stay with her best friend Tatum (Rose McGown). Unbeknownst to Sydney and the town, a killer is on the loose. Killing two teenagers and the town awakening to a double murder it gets everyone feeling scared. They issue a town curfew while the killer is loose. Sydney feeling scared and having the memories of her mother's death brought back to the forefront, she wants to go into hiding. She doesn't even want to hang out with her boyfriend Billy. Tatum talks her into going to a local house party that is being thrown since all of them can't be out in town. Annoying Sydney even more is the fact that reporter Gail Weathers (Courtney Cox) is back in town. She reported the care of Sydney's mom and claims the person who was convicted for the murder is innocent. Sydney wants nothing to do with her but Gail is very persistent. Will the killer strike again in Woodsbury and if so who is the most in danger? Want to link up? Join in! 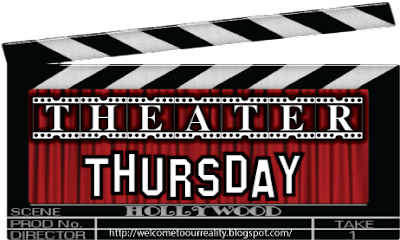 Post your Theater Thursday, come back here and add your link and use the button! Let me see what movies you've been watching. Even now, I continue to be mesmerized and frightened by the use of horror and comedy within Scream. Great selection!